"My time as a graduate student at the Frost School of Music was no less than transformative for my life and career as a composer, arranger and jazz pianist. The exceptional faculty, who were true mentors, challenged and inspired me on a daily basis, instilling both the technical foundation and versatility necessary to succeed as a modern musician. Recording in state-of-the-art studios with professional-level student ensembles and engineers and tapping into our incredible network of alumni across the world and in every facet of the music industry have proven invaluable." Dr. Scott Routenberg, M.M. '03, M.M. '05, D.M.A. '08, enjoys a versatile and prolific career as an award-winning composer, arranger, jazz pianist and orchestrator. For over a decade, Routenberg's "groundbreaking"1 and genre-bending music has garnered widespread critical acclaim, with the artist emerging as a "distinctive original voice"2 in modern jazz composition. In 2004, Scott was the first jazz songwriter to win the coveted John Lennon Songwriting Contest Maxell Song of the Year for his electro-acoustic big band composition Bandwidth (EMI Records). Other notable awards and honors include The ASCAP Foundation/Symphonic Jazz Orchestra Commissioning Prize (2016), the International Society of Jazz Arrangers and Composers Symposium SONIC Award for Best Arrangement (2017), the ASCAP David Rose Scholarship, Composer Scholar at the Henry Mancini Institute in Los Angeles, the ASCAP Foundation Young Jazz Composer Award (three-time winner), participant in the ASCAP Television and Film Scoring Workshop and the DOWNBEAT Student Award for Best Extended Length Composition. As a jazz arranger, Routenberg has been commissioned by multiple Grammy-winning ensembles and artists, including the Metropole Orkest (conducted by Vince Mendoza) and harmonica virtuoso Howard Levy. His "inventive" arrangements "breathe new life" into the music and "leave the audience spellbound" (Jeremy Monteiro). Routenberg's orchestral music has been premiered by the Symphonic Jazz Orchestra, the Atlanta Symphony Orchestra, the Houston Symphony Orchestra and the New York Youth Symphony, among many other ensembles. World premieres include Austria, Ukraine, the Netherlands, Poland, Norway, China, Singapore and Thailand and domestic premieres include Carnegie Hall, Lincoln Center and Los Angeles. Hailed as a "rising-star pianist" who has "found his own voice in the modern mainstream" (Scott Yanow, JAZZIZ), Routenberg has performed with internationally renowned jazz musicians the likes of Howard Levy and Christian Howes and has opened for jazz guitar legend John Scofield. Exhibiting a "formidable mastery of keyboard technique" and a singing tone "like drops of liquid gold,"3 Routenberg has thrilled and delighted audiences throughout the country. Jazz festival and club performances include the Montreux Jazz Festival, Jazz à Vienne, the North Sea Jazz Festival, Indy Jazz Fest, The Green Mill (Chicago), The Jazz Kitchen (Indianapolis), The Velvet Note (Atlanta), The Palladium (Carmel, IN), and The Biltmore Hotel (Coral Gables). The Scott Routenberg Trio's debut album on Summit Records, Every End is a Beginning (2017), reached #65 on the JazzWeek radio chart, #33 on the Roots Music Report Top 50 Jazz Albums, and was named Jazz Album of the Week by soulandjazz.com. The Creative Source's Dr. Brad Stone calls the album "an early candidate for jazz record of the year." Scott's jazz piano teachers include Brazilian legend Manfredo Fest (keyboardist and arranger for Sergio Mendes, Brazil '66 and Bossa Rio), Chip Crawford (Grammy Award winning pianist for Gregory Porter on Blue Note records) and Vince Maggio (student of Oscar Peterson and roommate of Bill Evans). His composition and arranging teachers include Gary Lindsay, Ron Miller and Raul Murciano. Routenberg is a graduate of the University of Miami Frost School of Music and the University of North Carolina at Chapel Hill. 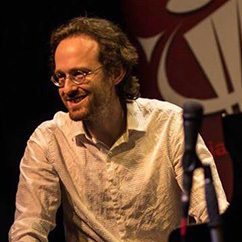 Dr. Routenberg is currently Assistant Professor of Jazz Piano at Ball State University. 1 Andrew Paul, American Diplomat and Cultural Attaché, on the Ukraine premiere of the Concerto for Jazz Violin and Orchestra, 2014. 2 Fred Sturm (1951-2014), jazz composer and educator. 3 Louise Causey-Lewis, Hilton Head Jazz Society Scholarship Concert, 2003.